Foreign Secretary Jeremy Hunt will visit Oman, Saudi Arabia and the UAE later this week to inject fresh urgency into Yemen’s peace process. The Foreign Secretary’s visit is part of sustained UK diplomacy to bolster the Yemen peace process. The Foreign Secretary’s discussions will build on the meeting of Quad – UAE, Saudi Arabia, UK and US – foreign ministers he chaired on 13 February and come after the Prime Minister’s recent announcement of £200million of new UK aid for Yemen. The UK is putting its weight behind the efforts of the UN Special Envoy Martin Griffiths to accelerate implementation of the actions agreed at the Stockholm peace talks. For the third time in three months the Foreign Secretary will engage senior Government of Yemen figures, Houthi leaders and politicians in Oman and Saudi Arabia to press for the progress that Yemen badly needs. I will travel to Saudi Arabia, Oman and the United Arab Emirates later this week to add further impetus to the peace process in Yemen. My aim is to build on the UN-backed agreement reached in Stockholm in December. The peace process has allowed a sustained reduction in fighting in Hodeidah. But more needs to be done. In my discussions with the Houthis and the Government of Yemen I will urge all sides to accelerate the redeployments they agreed at Stockholm and ensure the flow of humanitarian relief. Moving these forces away from the ports is necessary to prevent a return to fighting, prepare the road for the next round of peace talks and ensure desperately needed humanitarian aid is able to reach those who need it most. In wider meetings with his counterparts in Saudi Arabia and the United Arab Emirates the Foreign Secretary will reinforce the UK’s continued commitment to regional security, prosperity and human rights issues. In Saudi Arabia, the Foreign Secretary will also address a global conference on patient safety. 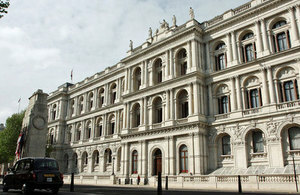 In Oman, the Foreign Secretary will agree a new Joint Declaration to accelerate UK-Omani partnership.